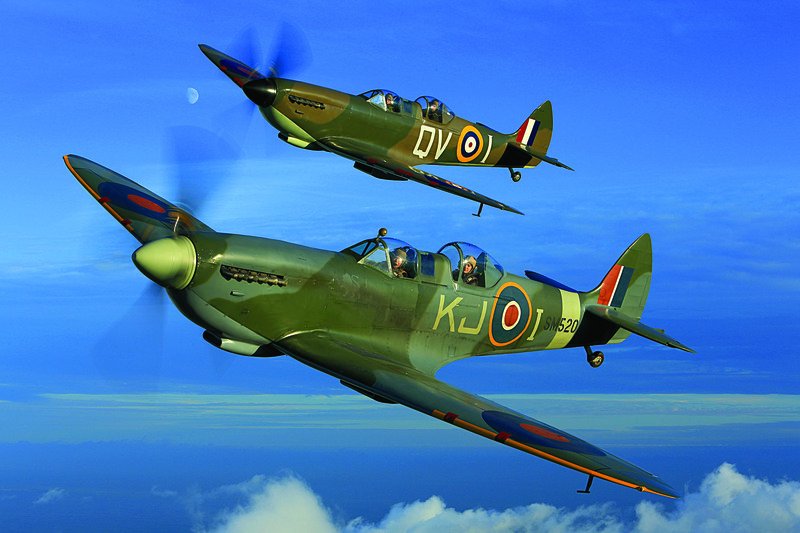 Spitfire Pilots for the day, Achtung – Spitfire! The most amazing experience for 2people Scramble from Goodwood Aerodrome with your partner into twowaiting Spitfire TR9’s to intercept an errant ME109 (Bouchon) (the actual plane seen in the new D-Day Movie) over Selsey Bill. You’ll get three hours of ground school with fighter pilot instructors discussing how aerial combat is fought, the advantages and disadvantages of the Spitfire over the ME109, and the purpose of a wingman; one hour brief on Safety Equipment and Emergency Procedures including abandonment and forced landing drills; pre-flight brief; 40 minutes in the Spitfire (30 minutes airborne) alongside a second Spitfire TR9 occupied by your partner. This time will include a demonstration of the skills required to lead an attack on the ME109 (Bouchon), and then act as wingman while your partner acts as leader, post flight brief. Subject to suitable dates, you will be joined on the day by Air Commodore Charles Clarke, President of the Royal Air Force Ex-Prisoners of War Association and Chairman of Bomber Command Association. Charles Clarke was shot down over Germany and imprisoned in the camp from which 76 prisoners tunnelled out in the “Great Escape” – Sagan [Stalag Luft III] in Poland. He later took part in the “Long March” of British PoWs who were ordered to move great distances across Germany in the last months of the Third Reich. Please note: You will experience 3G (3 times the force of gravity) continually on these flights. If you are susceptible to motion sickness then please consider carefully. Restrictions – Minimum age 18 Years old. You may need to provide photographic ID Passport/driving license. Maximum Height 6ft 6 inches (198cm), no minimum height. Maximum weight 230 lb, 105Kg. You will be weighed and measured on the day. You need to be healthy and agile enough to climb into the aircraft and safely experience the dynamic nature of the flight. You should not participate if you are on prescription medication, suffering from a cold, are pregnant or suffering from any condition affecting your breathing or consciousness. Date TBA. Must be taken within 12 months of auction.